NEW YORK – Today, Manhattan Borough President Gale A. 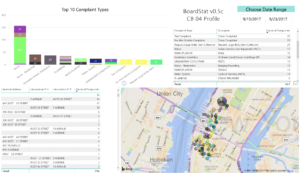 Brewer and BetaNYC unveiled BoardStat, a new interactive tool help laypersons sort, display, and map 311 complaint system data without advanced technical skills or specialized software. BoardStat was built to bridge the gap between merely providing access to open data and making that open data truly usable. Designed with Community Board members and other civically active New Yorkers in mind, the tool allows anyone with internet access to construct and examine summaries, graphs, and maps of New York City 311 data for each of Manhattan’s 12 Community Districts. BoardStat was unveiled at Brewer and BetaNYC’s 311 Data Jam, held today as part of the National Day of Civic Hacking. The event brought together more than 70 civic hackers, data scientists, and civically active New Yorkers to tackle challenges related to using New York City’s publicly-available 311 system data. At the event, Brewer and BetaNYC credited Microsoft for the technical assistance it provided in the development of BoardStat. Using PowerBI, Microsoft built hyperlocal data dashboards to visualize New York City’s open data related to 311 service requests. Through a train-the-trainers approach, Microsoft has also worked closely with the Brewer’s office and BetaNYC to ensure that each has the tools and know-how to work with dozens of Community Boards to replicate BoardStat PowerBI dashboards using the data most relevant to their own communities. BoardStat picks up where the city earlier left off, in using 311 data to inform local decision-makers and the public. After the introduction of the city’s 311 service request system in the early 2000s, then-Council Member Brewer passed Local Law 47 of 2005, which required city administrators to make periodic reports on 311 data available. For a time, city administrators held “CityStat” briefings for Community Boards and elected officials, but this practice was later discontinued. Now, BoardStat offers Community Board members and members of the public the ability to build their own “CityStat”-style reports and ask questions of the data, easily and without the need for advanced software or skills. BoardStat portals for each of Manhattan’s 12 Community Boards will be accessible online through the Manhattan Borough President’s web site. Manhattan Borough President Gale A. Brewer is the author of New York City’s Open Data Law. As a member of the City Council, she served as the founding chair of the City Council’s Committee on Technology, and she is an advocate for transparency and technology in government.